A caricature of Erion Veliaj produced in the context of the protests against the Lake Park construction work. 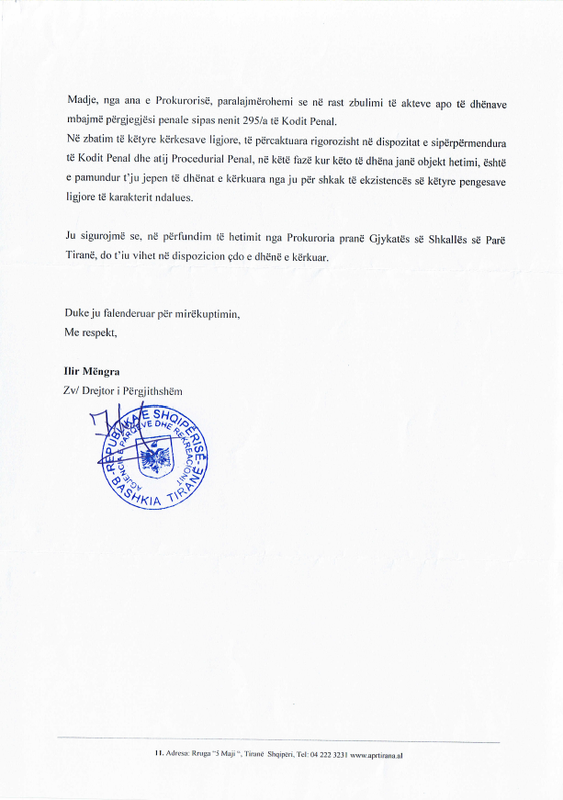 These documents [concerning the “children’s corner”] have been sent to the public prosecutor, which has included them in the investigation file. Under these conditions, these data in a juridical sense are treated as proof and as such fall under the secrecy of the investigation, which […] are prohibited from publication, fully or partially, as part of the preliminary investigation until the end of the investigatory process. In other words, the municipality is using the protection of evidence during a criminal investigation precisely in order to withhold this evidence from the public, thus adding a new layer of perversity to the entire process. In the meanwhile, truck after truck filled with concrete arrives every night in the park, so that even if the Municipality will be convicted and asked to return the park to its original state, the damage will already have been done. Obviously the Lake Park construction is a total PR disaster, and future contenders for Veliaj’s position will no doubt use the “restoration of the park” as a rallying cry. Hence, we were recently informed about another ambitious plan, the “return to identity” of Skënderbeg Square. Now that’s a golden oldie! 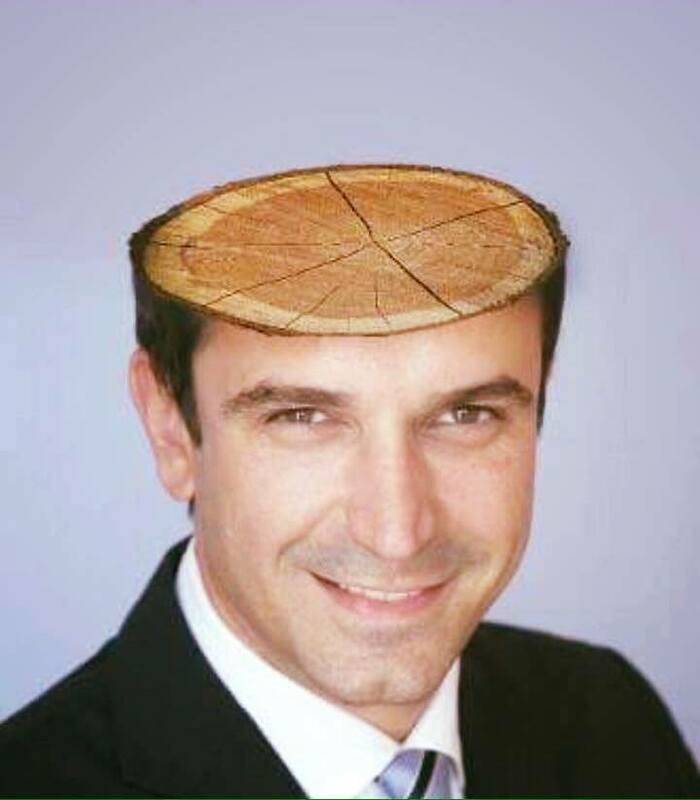 Veliaj wouldn’t be a Real Mayor of Tirana if he wouldn’t waggle his tail over that most coveted piece of public space, where regime after regime has left its droppings for all to smell. Ardian Vehbiu, in a recent post on Peizazhe të fjalës, already made the valid claim that the entire project is a “scenography” rather than a “rehabilitation,” a project that, apart from certain potentially positive aspects such as the attempt to make the square car-free, is mainly programmed and timed to generate positive PR – and to show off a lot, a lot of trees. At first sight, the current rehabilitation project launched by Veliaj c.s. 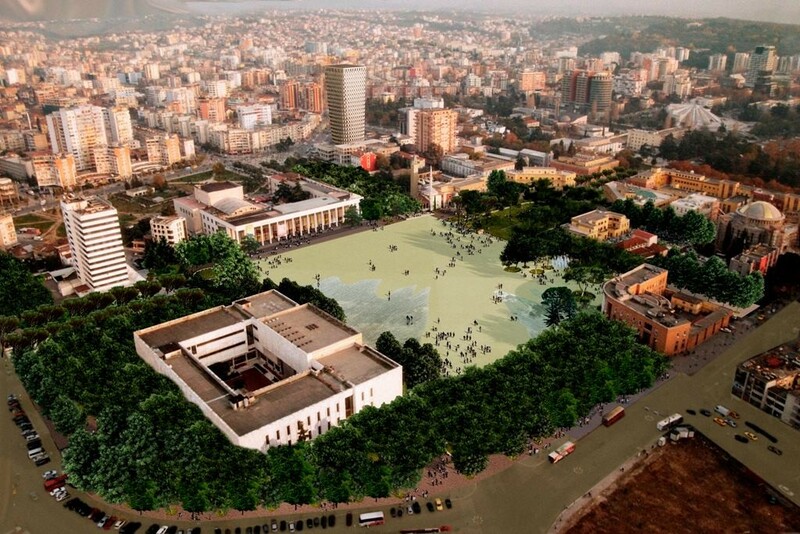 looks like the Skënderbeg Square project proposed in 2008 by 51N4E & Anri Sala, during the period current PM Edi Rama was mayor of Tirana. However, none of the official sources mention the original designers of this “vision” (on Facebook, Veliaj only credits Rama). Is this perhaps because 51N4E, designers of Edi Rama’s private bunker and private art gallery, would rather no longer be publicly associated with the project that forced their co-founder Peter Swinnen to resign from his position as chief architect of Flanders, after an audit report revealed corruptive practices and conflicts of interest related to the urban regeneration plan commissioned by Rama? 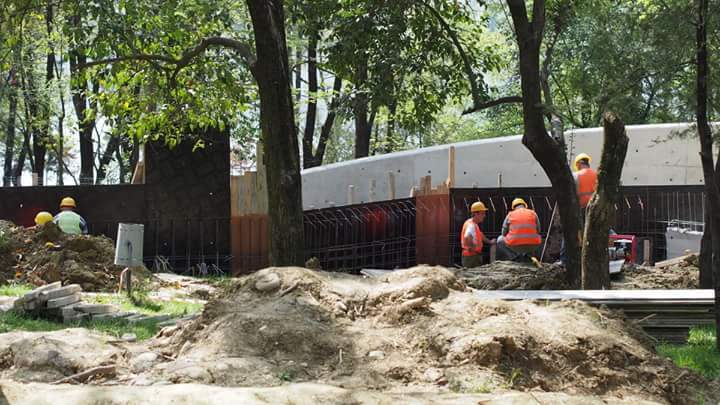 As regards the vegetation, the project will bring to the center of Tirana a variety of trees and plants from all over Albania: the green space will be planted with 900 large decorative trees, 520 fruit trees, 954 large shrubs, 4400 small shrubs, and 35,000 flowers. a public, green space, planted with all the flowers, plants, and trees which are mentioned in the Qu’ran and the Bible (and other holy scriptures) […with] as its center the “pyramid” and all green spaces where we aim to create a tangible image of our country’s religious harmony, including those whom [sic] do not believe. Whereas in the case of the Faith Park project, which is included in the larger Tirana Masterplan vision that I extensively discussed in a previous essay, the variety of trees and flowers from all the holy scriptures signifies “religious harmony,” the variety of trees and flowers from all over Albania becomes a signifier for “national unity” in case of the new Skënderbeg project. What is important here is the specific way in which such “unity” is brought about. Contrary to the wild and spontaneous growth of trees and plants in the Lake Park, which, although fundamentally artificial in nature, was designed to imitate uncultivated forest and park areas, only a precisely enumerated, named, tagged, and presumably “well-balanced” variety of trees and plants can signify unity and harmony. 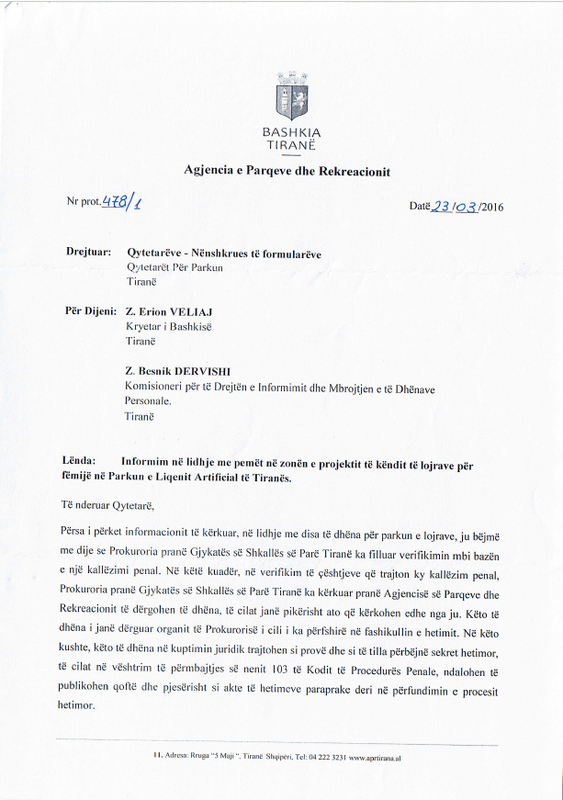 In other words, both the Faith Park and the Skënderbeg Square project signal a very important ideological presupposition underlying the politics of Edi Rama and Erion Veliaj: only order composed and imposed from above can create unity and harmony. In this sense, the contrast between on the one hand the Lake Park, where the natural growth of trees is jeopardized by concrete walls and meters-deep foundations, and on the other the Skënderbeg Square to-come, with its carefully selected and ideologically predestined vegetation and pavement, is very clear: they both represent political models. The latter – top-down – is to be desired and cultivated, whereas the former – bottom-up – is to be undermined and eradicated. The central square of Tirana is designed as a void in the chaos of the city, a void shaped by a collection of gardens and public buildings, both existing and new. This surrounding green belt functions like an antechamber, negotiating between the congestion of the city and the emptiness of the square. From the empty center, the full range of buildings defining Albania’s past can be seen, representing a common past that can be built upon. The oppressing monumentality of the communist constructions is countered by the shape of the square: a large, low pyramid. Standing on top of this pyramid, one is no longer overpowered by the architecture of the past. This subtle intervention acknowledges Albania’s past, and gives it a new perspective as well. 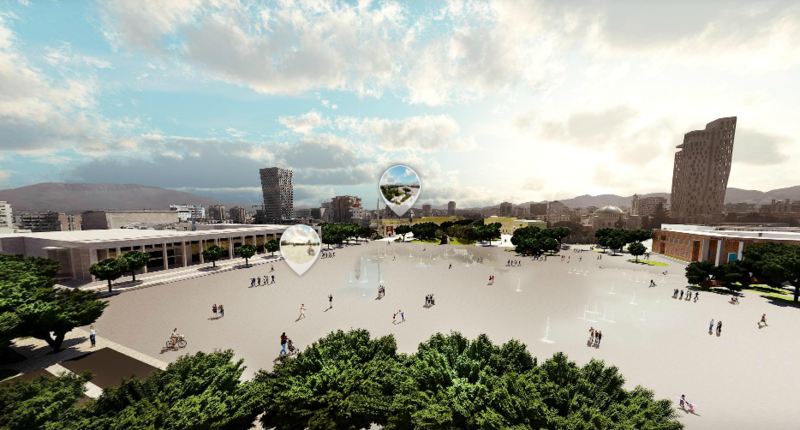 As is very clear, apart from the green and water spaces on Skënderbeg square, the original vision from 2008 proposed a “large, low pyramid” to shape the empty space in the center of the square. This pyramid (a brilliant intervention, I find) not only mirrors, but perhaps counteracts the other pyramid in Tirana that still dominates the cityscape through both its form and idea, as it also allows the citizens to “elevate” themselves, to become, so to say, temporarily the primary monument of that historically charged square. It communicates a very specific humanist and, dare I say it, anthropocentric view of the citizens of Albania, in which the crossing of an otherwise sun-blazed, blinding, and agoraphobia-inducing square becomes a play of perspectives that creates a very specific consciousness of situatedness and potential empowerment. Screencap from a 3D rendering of Skënderbeg Square to-come. The “renewed” vision presented by Erion Veliaj remains ambivalent at this point. The low pyramid is not mentioned anywhere in his plan, but the mock-up image, provided in the press package and inserted above, faintly suggests two diagonal lines crossing between the Et’hem Beu mosque and the National Historical Museum, and Palace of Culture and the National Bank, respectively. By contrast, the 3D rendering shown on a separate website shows no such diagonals or any other trace of a pyramidal architecture. Instead we are confronted with a desert-like, monolithic, grey surface on which individual citizens struggle to make their way across a panoptic, non-Euclidean perspective. 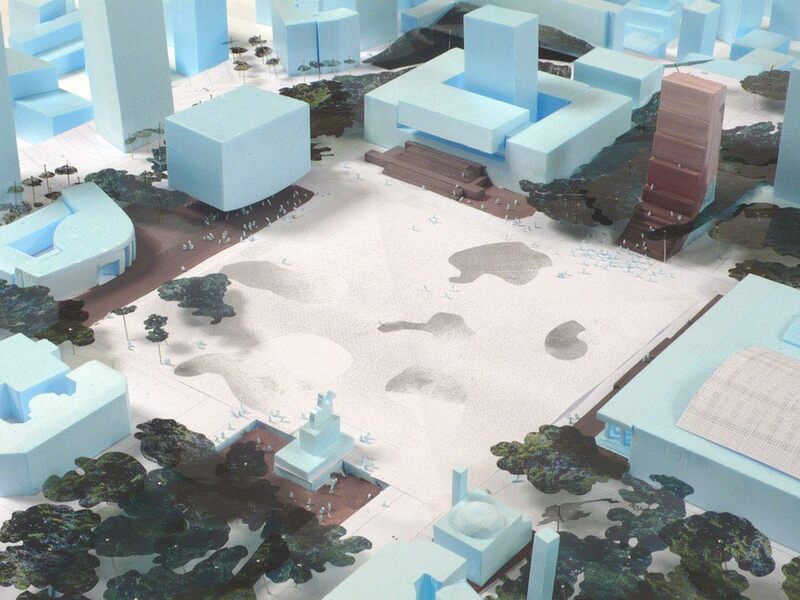 Whereas the original intervention of 51N4E and Sala potentially turned the square into a place to explore and hang out, a site, perhaps, to enact forms of citizenships and social relations, the bleak vision offered by Veliaj’s 3D model offers a shadeless void, where any possible political expression is preemptively neutralized by nationalistic pavement and unifying vegetation. 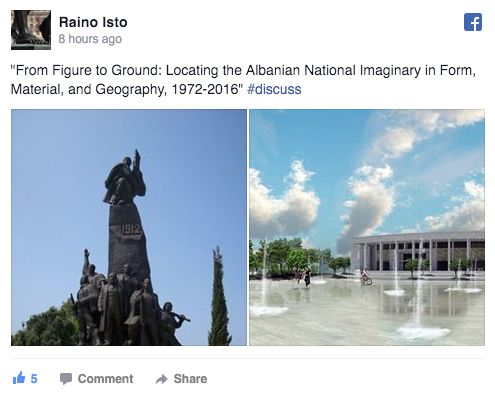 In a recent Facebook post, art historian Raino Isto hinted at a possible relation between the Monument for Independence in Vlora, sculpted under the direction of Edi Rama’s father, Kristaq Rama, and the Rama-Veliaj’s current project for Skënderbeg Square. This was a correct intuition. Comparing the 2016 plan with the 2008 plan reveals several alterations that cannot be accounted for as merely “finishing a job left undone.” The implicit Albanian (pan)nationalism, the presuppositions on the genesis of order predicated on the pavement and the vegetation, and the reduction of the citizen from self-empowering figure with a unique individual perspective to self-effacing line of flight on an ideologically predetermined surface are all indices of what has changed between 2008 and 2016, and offer us an unambiguous promise of the Albanian state to come. PM Edi Rama ostensibly looking at a 3D projection of Skënderbeg Square. Does he see the pyramid? an important part of the image that the Rama government is intent on creating for Albania is based on his former accomplishments in urban development as Mayor of Tirana.